We had a lovely day with our family on Easter Sunday. I love gathering for great conversation, and great food. 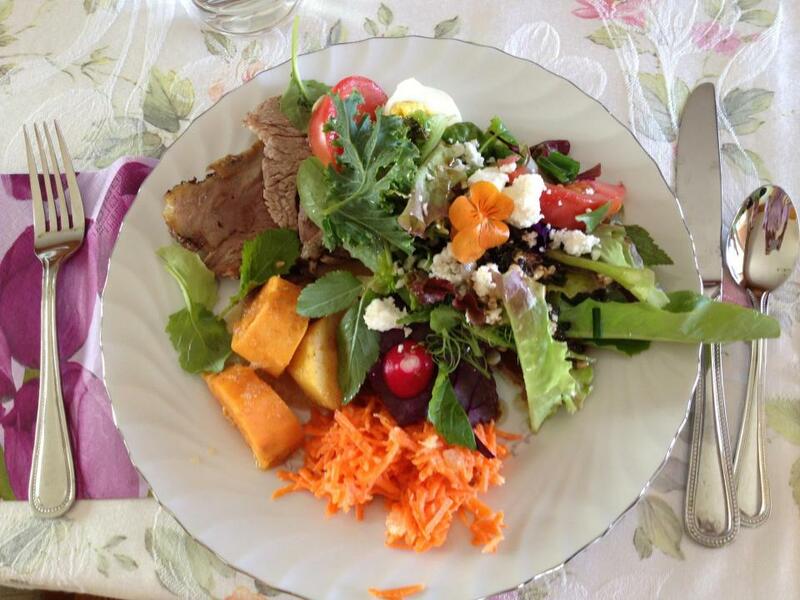 Here we have lamb chez Tom, sweet potato medley by Judy, carrot and pineapple salad that Aunt Sue made, salad freshly picked by yours truly. The salad mix included beet tops and young turnip greens, kale, baby romaine, outredous, and flame lettuce, pea tendrils, radishes, green onions and violets. I topped the lettuce with a vinaigrette that I made by slightly sauteing garlic, oregano, mint, parsley and wild celery in olive oil and then mixing it with balsamic vinegar. I had some feta to add per individual taste. All of these items will be available in the first CSA delivery. I may just mix a salad blend the first week for you to try. This week we are putting lots more seeds in the ground. My goal is to have 14 different varieties of veggie seeds planted by Tuesday, and some of the transplants set out in the gardens for a head start. We also will be planting more strawberry plants, raspberry plants, and rhubarb later on in the week. Hope you all had as wonderful weekend as I did! I adore pea tendrils and beet tops. It’s so nice to see you guys promoting the utilization of the whole plant! Dumb question but is it wild celery because you find it growing wild? I have never seen it before. Our “wild celery” is a perennial celery that my husband found close to a woodline on a job he was working. He dug some of it and potted it. It is perennial and hardy to Zone 5. It grows low and bushy, with larger leaves and thinner stems than our grocery store variety. It has a great celery flavor! I think it is called wild celery because it it hardy and reseeds itself easily. I need to stop by and check out the wild celery.